Getting the contents of three masterly creations of epic proportions spanning over 3500 pages of text and commentaries into a small book of 200 pages for synoptic study by my readers would appear a foolhardy attempt, but I am glad to express that such a condensed version of three of the most important works of Vedantha Desika is indeed before them. All my effort would indeed be worth its while if they would complete reading it and more importantly call for the unabridged versions of the respective books for a more serious and detailed study. 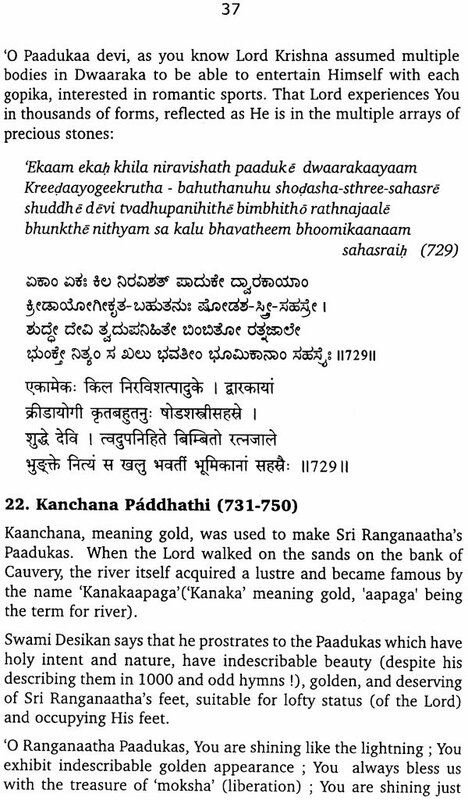 Paadukaa Sahasra, in a mini book version was in fact my first book. I have added more muscle to it now, if you please more precious stones to the mani Paadukas. For each paddhathi (chapter), I have incorporated one or two slokas considered most relevant to the title and import of each chapter. Vedantha Desika says at the end, that his life's mission is fulfilled - nowhere does one find him to be so exuberant making such a statement about his experience ! During the last seven years of my service I lived in Secunderabad where I had opportunities to meet and listen to Srivaishnava masters on various subjects. 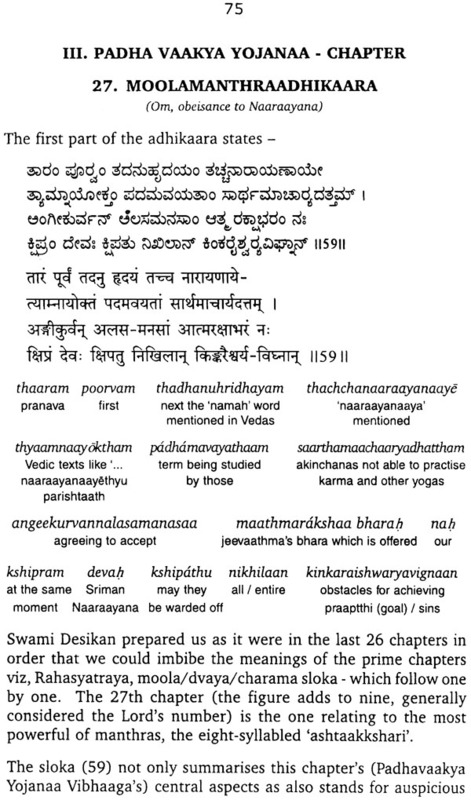 One such subject was Yaadhavaabhyudhaya. I attended a Kaalakshepam, call it a lecture series, when my interest in the work was kindled. This lay dormant since, and over a period of time I made some studies on the subject. 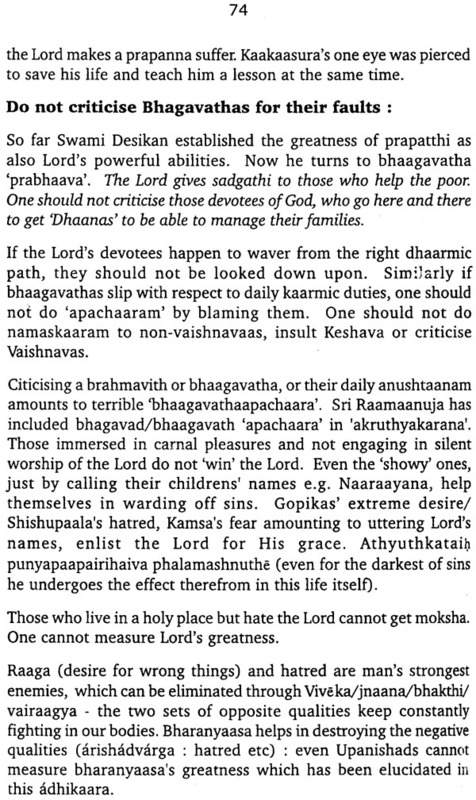 I was mainly drawn to Utthamoor Veeraraaghavachariar Swami's book with Tamil explanations. Enjoying the 'rasam' of each of 2643 slokas was indeed an ennobling experience and in this long journey I enlisted the help and company of my wife Smt. Vasanthi, who stood up to the task. The result is in front of the readers. Recently after publishing my book on Amudanaar's 'Raamaanuja Nootrandhadhi', I was talking to Sri Anantha Rangacharya who enquired as to what my next book would be on. 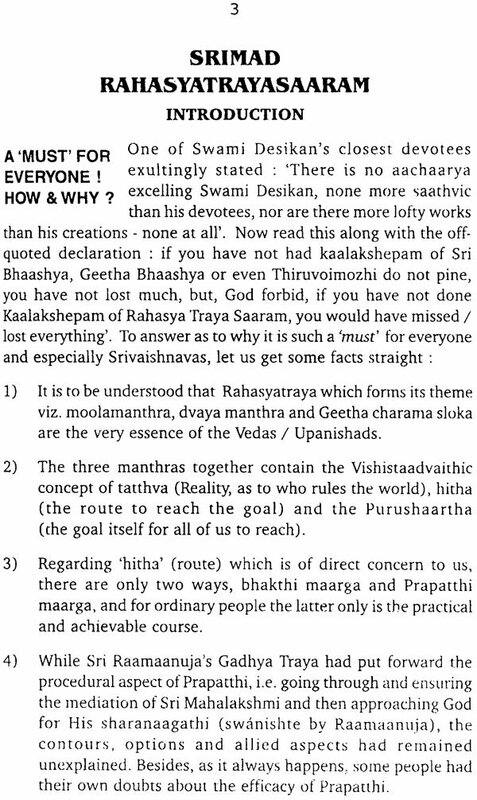 I replied saying that after covering a sizeable ground relating to Sri Raamaanuja's works, I was toying with the idea of undertaking a similar exercise with Vedanthachaarya. Pat came his words: 'do one on Rahasyatrayasaara'. In fact his suggestion came once again. I thought it was God's will that I should attempt the final frontier (perhaps the inescapable one) without which anyone's writing is incomplete. Superlatives upon superlatives, have been showered in the past 6-7 centuries lauding its greatness, the inimitable stamp left behind by Vedantha Desika, Rahasya Traya Saara, a diamond treasure. Lord Hayagreeva's kalyana gun a of supreme grace is unmistakable in this work. I thank Sri Anantharangachaarya for suggesting to me to write this work so soon. 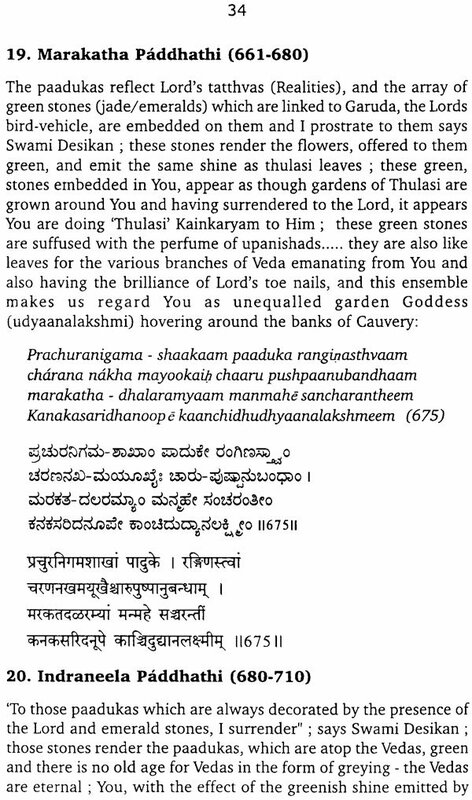 If Paadhuka Sahasra covers comprehensively the miracles of Lord's Thiruvadi, our final goal, Yaadhavaabhyudhaya talks about the Lord's adventures, sports, miracles to reinforce dharma, and Rahasyatrayasaara glorifies the summum bonnum of all Vedas and Upanishads - a systematic elucidation of the three secret manthras (some call them 'mysteries'). All of them are standing examples of Vedantha Desika's unmatched ability in presenting a subject with perfection to the core aided by his supreme hold on Vedas, Upanishads, Smrithis, Ithihaasas, Puraanas, and 'life at large here', and using them all to present the 'message immortal' in an 'inimitable manner' - for, otherwise how could such greats as Appaiah Deekshithar find it worthwhile to write commentaries on his books. The poet in him, if he had chosen writing 'poetry alone', would have placed him alongside Kaalidaasa, Bhatta, Baana etc. His various works demonstrate his superlative ability as a poet unparallelled on the canvass of religious subjects. I thank Dr. N.S. Anantharangachaarya for writing a foreword to this book. Who could be more qualified to talk about these works than Dr. Achaarya ? - besides other books, he has written books on Paaduka Sahasra and Rahasya Traya Saara, and is now giving 'Kaalakshepam' on Yaadhavaabhyudhaya. I thank Ms. Sudha for attractive DTP work and Mr. Swaminathan of Sri Maruthi Graphics. Mr. Sharada Prasad has as usual done a good job of printing at short notice. Mr. Kiran's art work of the cover pages of my books has come in for praise by readers as also book-sellers. I thank him also. My friend Sri K.R.Krishnaswami has asked me to write a foreword to his latest monograph 'Three great creations of Vedanta Desika' and I consider myself honoured, though I do not deserve it. Sriman Nigamantha Maha Desikar is a most celebrated scholar, philosopher, poet, saint, logician and systematiser after Ramanuja. He has authored more than a hundred celebrated works, which are eternal monuments of wisdom and knowledge. He established on firm grounds the teachings of Ramanuja through his great commentaries, prakarana granthas, polemic works and the great literary monuments. He was a great devotee of the Lord and he lived a life of piety and renunciation. Every work of his has a legitimate claim to be his magnum opus. The works of the great acharya are a harmonious blend of literary excellence and philosophical insight. The author of this work has chosen to present in this work the essence of three major compositions of Vedanta Desika and has proved his ability to achieve a mighty task. 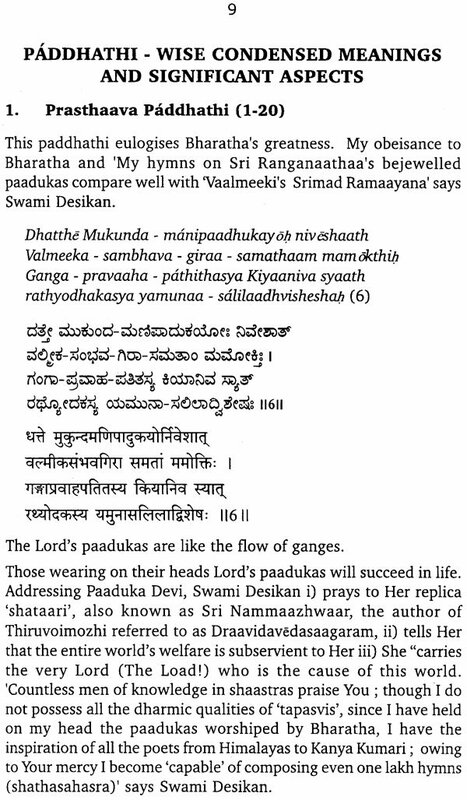 Paduka Sahasram is a literary gem as well as a stotram. The thirty two paddhatis are suggestive of the rare insight and poetical imagination of the author. The work is extoling the Acharya and the role he has in emancipating the forlorn piligrim on the path of samsara. 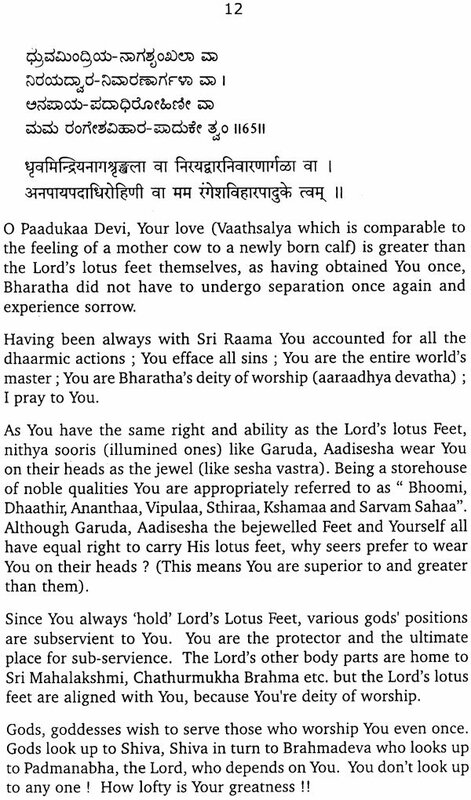 The great master says that Ramayana was composed by the sage Valmiki for glorifying the qualities of the padukas. 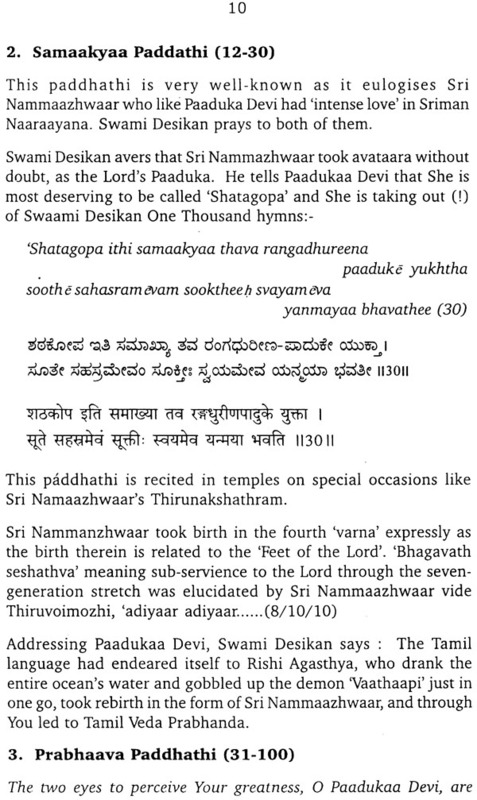 Yadavabhyudaya is a literary gem par excellence. It is composed in the Gowdi style and is enshrining the teaching of the vedantha harmoniously blended with poetical imagery. 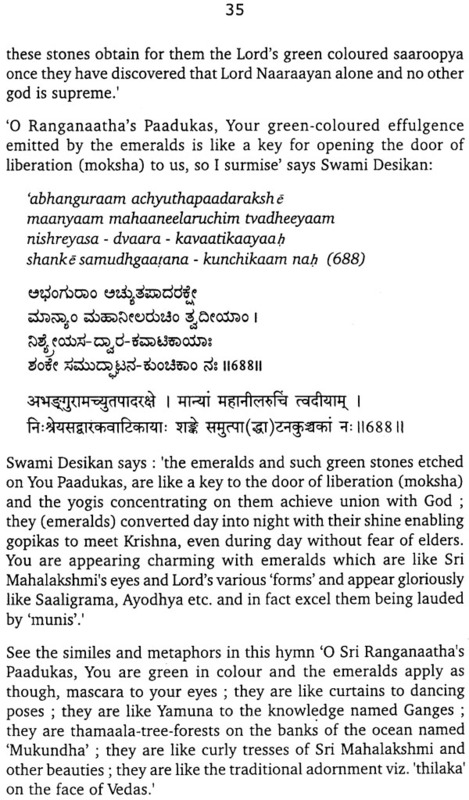 Sri Desika has worked out this mahakavya in such a masterly way that it exhibits his ability in grammar, rhetoric and the embellishments of the Kavya. A life time is not enough to understand and enjoy this gem of a Kavya. Srimad Rahasyatraya Sara is the acme of all wisdom. 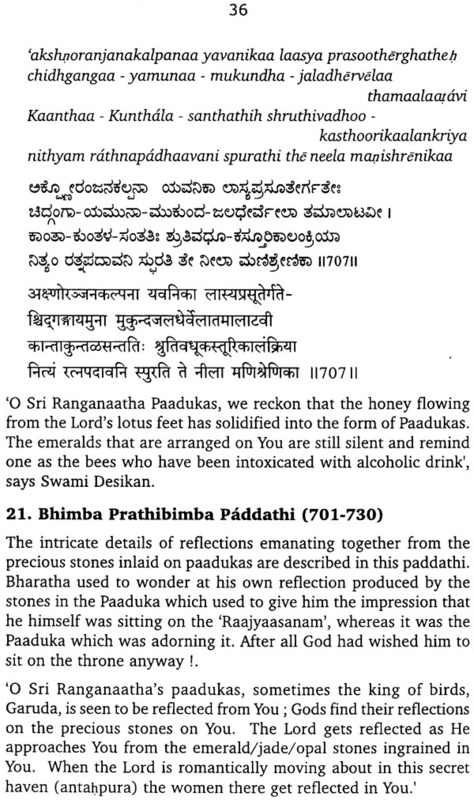 It was composed by Sri Desika in his ripe old age. Every statement made here is pregnant with philosophical thought and wisdom. It reflects verily the philosophical experiences of the author. Rahasyatrayasara is the esence of all shastras and all spiritual disciplines for attainment of perfection. Sri K.R.Krishnaswami has made an attempt to extract the essence of these three great works in one place and has gained remarkable success on this behalf. 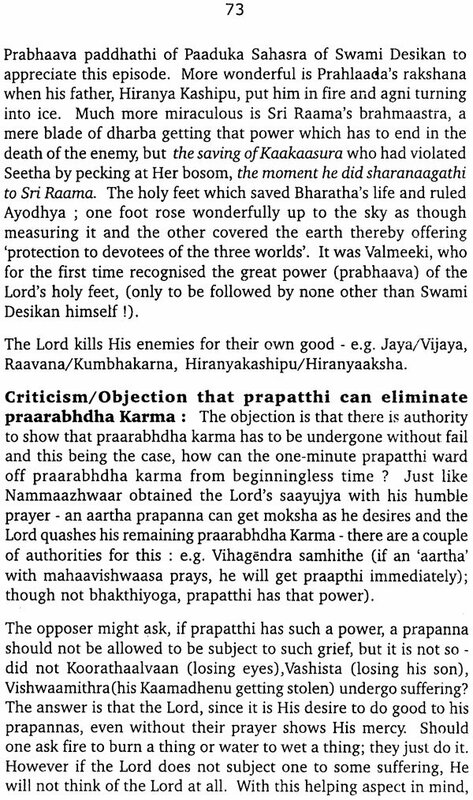 The essence of each section of Paduka Sahasram is drawn very clearly. 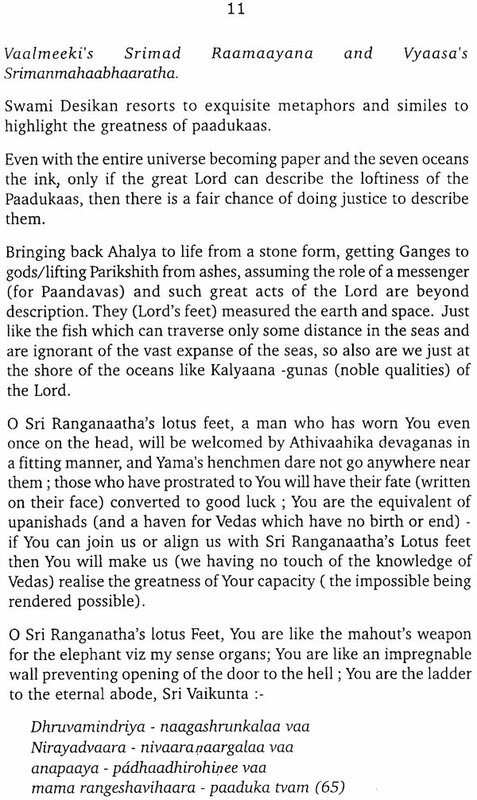 The gist of each of the 24 cantoes of Yadavabhyudayam is presented. The essence of each of the thirty two chapters of Rahasyatraya Sara is given here. The reader can get a glimpse of the contents of these three great works in one place. The language is lucid and simple. As a small mirror reflects a big object this work is very useful for even ordinary' people to know the contents of those great works. I heartily congratulate Sri K.R.Krishnaswami upon his achievement and I wish he will make many more such contributions.